Difficulty hearing on the phone? Obtain your free caption phone. A captioned telephone is a telephone and service for anyone who has trouble hearing on the phone. Similar to captioned television, this telephone uses advanced technology and a communications assistant to quickly provide written captions in English or Spanish of what callers say on a large, easy-to-read screen. It works like a regular telephone – simply dial and answer calls as usual – speak and listen using a phone handset like always. 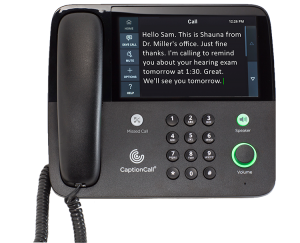 Plus, a captioned telephone offers exceptional sound quality with audio and frequency settings that can be customized to each person’s hearing loss. But best of all, it is FREE! To obtain a FREE caption phone, contact our office to obtain certification that you have hearing loss and experience difficulty hearing on the phone.